If your 4 o clock snack cravings are getting out of hand, then the rolls and kebabs at Indiranagar’s new eatery Urban Turban should do the trick. For heavier meals, there’s alway their meaty kormas and wood-fired biryanis. Vegetarians, you might not find much to eat here. For those who are always broke but always hungry. Everything here is priced between INR 100 and INR 275 max. Urban Turban is a small and longish space with wooden furniture and twinkling fairy lights. It is is actually quite pretty, with every table done up with cutesy jars filled with coloured water. I think this is the perfect date place especially when you are on a budget. Urban Turban is also very quiet, because it is really new and no one really knows about it till now. Try the Murgh Tikka roll here, a kathi roll with chicken kebabs rolled into a flaky egg paratha. Our other pick would be the Aloo Allure, a moreish potato and peas roll with some raw oniosn for the added crunch. The rolls here are pretty generous and you can even add an extra egg, chicken or mutton to make these into a meal. 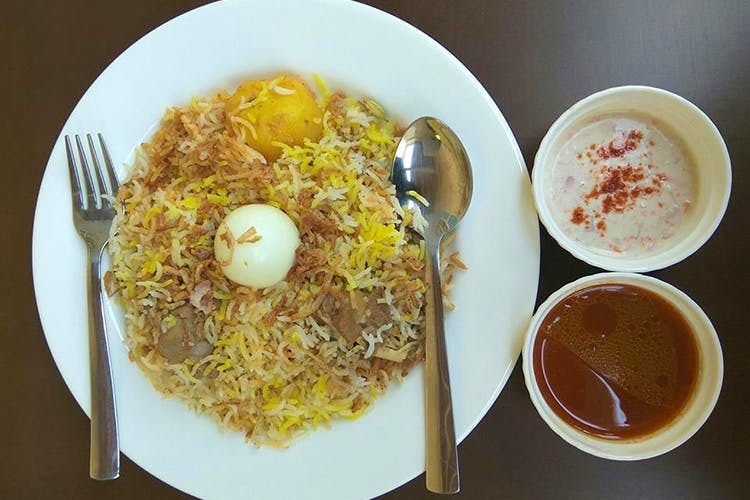 We are also giving the Kolkata style Mutton Maharaja Biryani a thumbs up. This comes with a piece of meat, a boiled egg and a meat flavour soaked potato. The service here is quick. And no one really bothers you once your order arrives. So you can hang out here with friends and no one will shoo you away. The only thing is, currently aerated drinks such as Coke is the only kind of beverage available. Also we found the rolls to be not-so spicy. But a handy bottle of piquant mint chutney and ketchup should help you customise your roll according to your taste. Urban Turban doesn’t accept cards as of now. So you will need to pay cash. They also don’t have delivery figured out yet. But you can always do a takeaway.